The UK has seen its fair share of rain, England more so than ever! This being almost irrelevant of the reigning season, promotional umbrellas are companions that you will make use of throughout the year. So for the increasing number of casual storms we are witnessing, a parasol may not do the job as well as this particular product may. Marketing professionals translate a grey sky into something completely different; when we at allbranded see a rainy day, we see opportunity. A platform to promote your message and/or business by making use of the everyday item; umbrellas. If you view every rainy day as an opening to subtly increase your brand awareness to the casual strangers at the train platform or while running out to the cornershop for some milk you will find infinite possibilities. The umbrella range at allbranded offers you attractive promotional products, among them, golf umbrellas. Available in various colours, you have the opportunity to print your message onto the promotional merchandise and trigger change by employing the relevancy of this product which has skyrocketed so why not use the grey sky to shed some light onto your business? It is not only VIPs and celebrities that can pull off the personalised golf umbrella on the golf course. 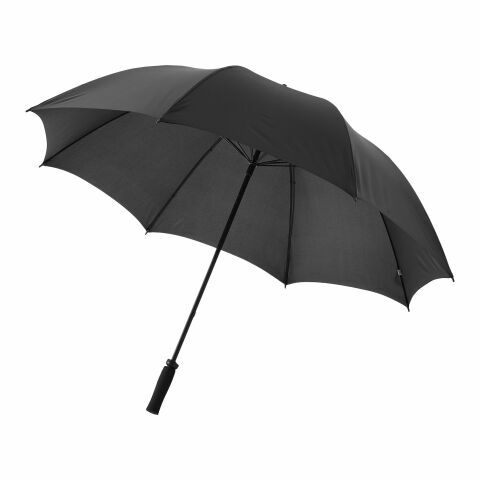 Due to its large canopy, the printed golf umbrella protects the owner more fully, be it from the sun or rain. The light golf umbrellas also relay an elegant look while being of rigid and durable make which makes it the perfect product to withstand the strong winds. Available at allbranded, printed golf umbrellas can be purchased as either custom automatic umbrellas or manual. Some variations are even constructed out of fibreglass and of course, the colour range available is significant. The golf umbrella is a very fashionable branded accessory with a high user value; the perfect promotional products. It optimises its excellent marketing effect through its sheer size and visibility as opposed to for example branded pens or keyrings. Decorate your premium golf umbrella with your logo and make it into an irresistible eye-catcher. We will print this premium item according to your specific instructions and allow your company logo to bloom into an striking marketing tool. If you prefer a more subtle advertising effect that is not overbearing in close quarters than we recommend the printing of one side of the canopy only. Alternatively, depending on the use, the printing on both sides may be more in your favour if you were to for example use the umbrellas at the beach or Golf course for shade, where the sun will illumine both sides . The practical use of the promotional Golf umbrella allows it to reach a wide target audience and thus can be used as promotional merchandise, giveaways or incentives for your customers. The nature of giveaways is largely an act of investment and the profit will be through finding new leads which will translate into the success of your business. It is also a perfect tool to reinforce existing relationships with long-term customers which illustrates a sense of appreciation and a positive attitude for future collective collaboration. Our range of branded personalised umbrellas are outstanding in quality, made out of fibrestorm for durability purposes and an aesthetically pleasing sight from both near and afar. The colour variation will promote your brand effortlessly, as does the size. While you’re at it, why not check out our other excellent personalised merchandise including keyrings, pens and mugs? The umbrella meanwhile has excellent features including the vented constitution which allows the wind to pass through its Polyester/Nylon in order to maintain its shape against strong winds. Need them quick? We are proud to offer you promotional express umbrellas! Meeting big demands on a tight deadline is what we are known for after all. In the online shop you can design your printed corporate umbrella according to your needs, tastes and requirements. Simply browse through our collection of high quality golf umbrellas and select one which you feel represents your business most accurately. Once you decide what type oflogo and/or text you’d like printed on the promotional product as well as colour schemes, we’ll get working! This being the process in any items you choose from our online store so feel free to find out more about our excellent merchandise ranging from mugs and pens to umbrellas and parasols.